This whole series of posts started off when various readers wrote to ask about working in ends. As I wrote then, IMHO, the best way to deal with end is not to have any. So far, this blog has shown five different ways to work in ends "as you go:" felting ends, overlap join, Russian join, back join and overcast method. A sixth method, added by Noricum (a reader) is to use the tails for seaming, which also eliminates the need to work in the tail. And yet, foresight will take you just so far. Sometimes, despite all your ingenuity and tricks, you're going to wind up with an old-fashioned hanging tail that needs to be worked in with a sewing needle. In May, this blog told you there are two different kinds of sewing needles, sharp and dull. It is possible to work in ends using either kind of needle: a sharp needle (called a "crewel," or "embroidery" needle) is used for SKIMMING, a dull needle (called a "tapestry" or "darner") for WEAVING. The next post will cover weaving, today we'll do skimming. (Below) Skimming-in ends is done with a sharp needle. The tail is fastened down as it follows the needle, the needle "skims" though the tops of the purl heads along the fabric back. This really is a case of a picture being worth a thousand (or at least a couple of dozen) words so here it is, illustrated. 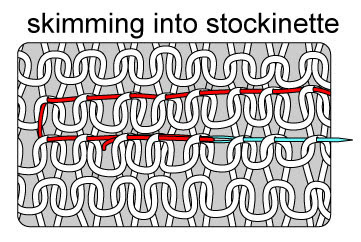 An aside: after drawing this, I realized that I always work the tail into the row in stockinette, but I'm not really sure why--On further consideration, there's no real reason not to work the tail into the column, just like for ribbing, so if you're inclined, then do it that way. (Below) For skimming-in ends through ribbing, turn the work inside out, and skim the end up one column of purl stitches, and down another. 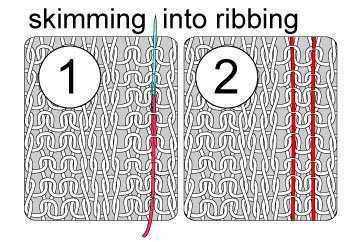 Because the purl stitches draw further into a ribbed fabric than do the knit stitches, skimming into the purls helps keep your tails invisible from both inside and outside of the fabric--handy when you want to fold your back your cuffs or hat brim. Be sure to work the needle through the very head of the purl stitch, which helps keep the skimming invisible from the front of the ribbing. In both of the above illustrations, the worked-in end takes a u-turn. This is very advisable in a slippery yarn, such as cotton, but could be skipped in wool. Also, these illustrations show the ends worked in, but before they have been adjusted--they are still stretched straight, under the tension imparted by the sewing needle. In real life, you'd stretch this area several times to adjust the tension, and you'd make up the garment and block it before cutting off the tails, giving those ends all the opportunity they need to draw up to their final length (and hopefully, to begin felting into the back face of the fabric). PS: Here is a link to a post with 10 (!) different methods of working in ends in knitting, eight of which are "as you go."